This is another simple pasta dish that will take longer to heat the water and cook the spaghetti than to make the pesto sauce. Although this recipe uses only four shrimp per serving (typical of some restaurant recipes) you can double the shrimp for a tastier dish. Start heating the water for the spaghetti. When it comes to a boil, add the spaghetti and a tablespoon of salt. Cook according to package directions. While the water is heating and the spaghetti is cooking, combine the garlic, parsley, artichoke hearts, cheese, lemon juice, and extra virgin olive oil in a food processor and pulse until nearly smooth but slightly chunky. Adjust for salt and pepper. Cover and set aside. Heat the cooking olive oil in a skillet and add the cleaned shrimp. Sauté until the flesh turns pink and the shrimp are barely cooked through. Remove from the pan and set aside. Add the wine to the skillet and bring to a boil. Reduce the heat to medium-low and simmer until most of the liquid has evaporated. Return the shrimp to the skillet and add the artichoke pesto. Heat thoroughly. When the pasta is cooked, drain and add to the skillet, stirring and turning to coat the pasta evenly. 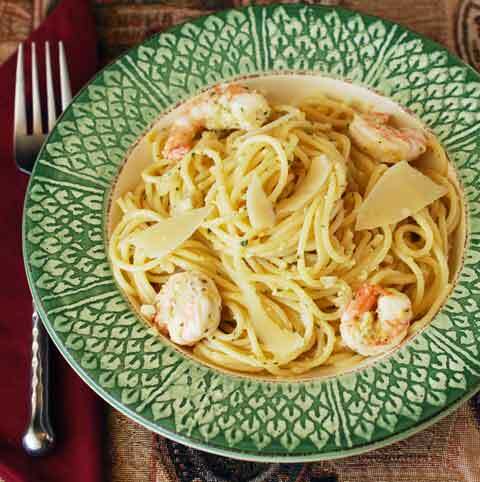 Divide the spaghetti among 4 dishes and place four cooked shrimp on each dish. Garnish with shaved cheese and serve.